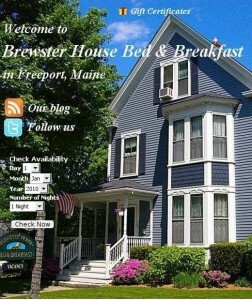 We’ve offered Brewster House Gift Certificates through our web site for several years, and each year (especially near the Christmas holidays) several people take advantage of them as gifts for their friends and family who love Brewster House, or to introduce them to Brewster House and Freeport, Maine. We recently became aware of an application that we could add to our Facebook page that will allow Facebook friends to purchase our Gift Certificates directly from Facebook. To use the Gift Certificate application, select the quantity you want (the base value is US $100.00, selecting multiples simply increases the value of your gift certificate, so if you enter “3” you will be purchasing a gift certificate with a value of $300), then proceed to check out. Your payment will be processed through PayPal’s secure checkout service, and we are notified of the purchase so we can send you your gift certificate. Be sure to include your mailing address so we can send the certificate, and also please provide a valid email address, so we can reach you if there are any problems. These will be sent free to addresses in the US and Canada. Other areas will be by arrangement. We wish this had been available earlier in the Christmas season, but better late than never!